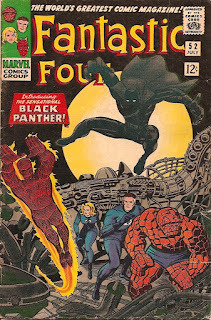 To celebrate the opening this week of the new Black Panther movie, here's my review of his first appearance in Fantastic Four #52 (the review was originally posted on December 22, 2010). I was an instant fan of the new hero - in fact, I dressed up as the Black Panther for Halloween - this in the days before glow-in-the-dark costumes were created. What could be safer than dressing all in black for trick-or-treatring? This issue of The Fantastic Four was smack in the middle of the long run that Stan Lee and Jack Kirby enjoyed on this series. And by this point, both creators were at the peak of their powers. They had just wrapped up a long series of connected stories that introduced the Inhumans and brought Galactus and the Silver Surfer to the Earth for the first time. They followed that with one of the all-time best issues in the series (#51) - and then this issue, which introduced a ground-breaking new character, one who earned a spot in the history of comics. 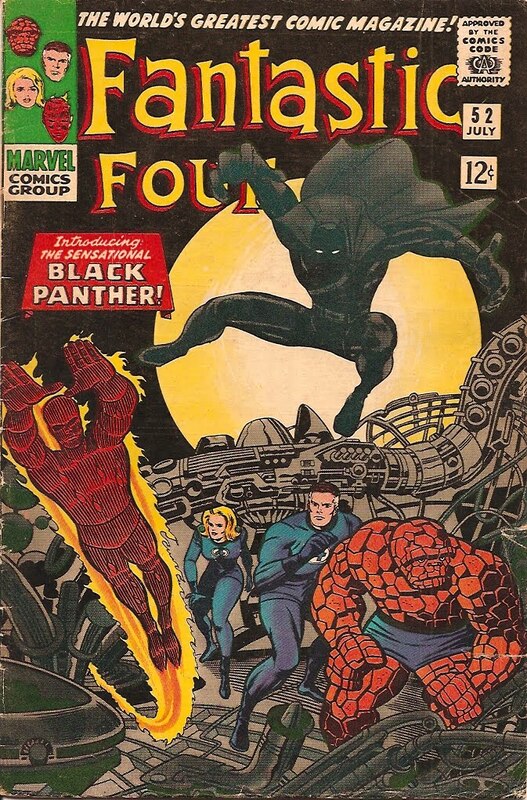 It marked the first appearance of the Black Panther. Cover dated July 1966, the Panther seems to be the villain in this issue. He lures the Fantastic Four to Wakanda, his kingdom in Africa, where they find themselves in an amazing, futuristic setting. The Panther appears and attacks the team, quickly separating them and defeating the heroes one at a time. Each battle is a pure delight, as the Panther triggers special traps and uses his own skills to overcome Marvel's "First Family." If there's a weakness in this comic, I can't find it. The action is inventive, the story rockets along at top speed, there's plenty of humor (The Thing is one of the few heroes who can be funny even while he's losing a fight), the dialogue is terrific, the characters are memorable, and the ending is a real surprise. This story is memorable for another reason - it's the first to feature a black super-hero. I don't remember feeling any kind of surprise about that - it made sense that an African Prince would be black, after all. But it was a ground-breaking event - though of course there were black heroes before, like Gabe Jones, a member of Sgt. Fury's Howling Commandos who was also a black hero, just a non-powered one. It's always a delight when a creative team really starts to click, and Lee and Kirby were on fire by this point in their careers. Lee's wordsmithing was never better, and Kirby was at the peak of his skills (ably assisted here by the great Joe Sinnott on inks - in my opinion, Joe is the all-time best Kirby inker). Each issue seemed better than the last - just an amazing achievement in comics. As a 10-year-old, by this point the FF was my favorite comic book of them all - and it would hold the title for years.